North Yorkshire is an area rich in prehistoric earthworks more commonly known as Dikes or Dykes, originally these were thought to date from the Iron Age but recent research suggest that they are in fact older and were constructed during the middle Bronze Age. Their purpose is not entirely clear, it could be that they formed part of large scale cattle ranching operations that were being carried out on the Wolds or they could mark boundaries between land belonging to different farming groups - they could even have had a defensive role. It is possible that they fulfilled all of these purposes at different times. 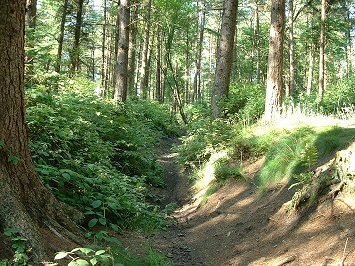 One of these dikes to the north of Dalby Forest is known as Dargate and survives fairly well despite the whole area being part of a Forestry Commission plantation. 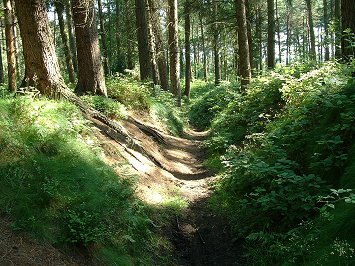 The earthwork runs south from the crest of land in Crosscliff Wood before turning southwest towards Dargate Slack. For most of its course it consists of 3 parallel lines of ditches 2 metres deep and nearly 4 metres wide each with a pair of earth and stone banks also about 4 metres wide, with the whole structure measuring over 36 metres across - towards the southern end it is reduced to a single ditch with flanking banks. The easiest place to see the remains of the dikes is just west of an area set aside for car parking and picnicking where the banks are very low but the ditches are still over a metre deep. See also Hole of Horcum, Thieves Dikes and Danes Dyke.